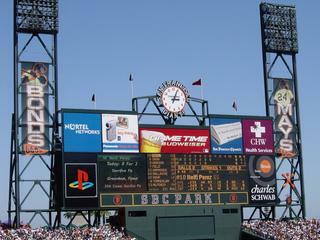 Browse: Home » 2004 » May » Giants win! Okay, I’m no sports fan, but I definitely enjoy going to games. 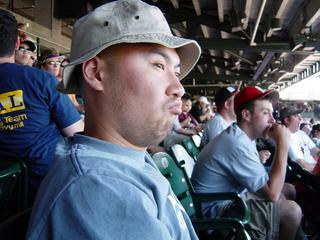 Today, I went to the SF Giants game with the inimitable Alan Yu. Going to a game at the stadium formerly known informally as “Pac Bell Park” is a real treat. 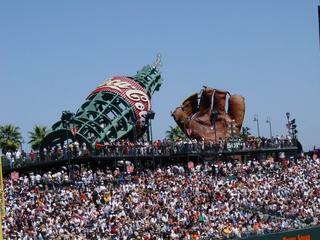 The stadium is positioned right on the edge of the San Francisco Bay, so home runs that go over the fence end up in the drink. (The guys out there in kayaks fight with each other over the home run balls.) And the stadium feels very personal, right down there on the field, similar to the Seattle ballpark and probably most other newish parks. It’s a great place to see a game! There’s more room there for ads than for actual scores. There are many other signboards in the park that scroll messages in lights, or roll ads from a variety of advertisers depending on which inning or swing it is. Sheesh. What I don’t understand is how they can be getting all this dough from the advertisers, and still charge us $34 for a ticket. (Kind of reminds me of the movie theaters.) But then I remember the expensive player salaries, and that there really is no ceiling on profit. The owner bought the company not as a charity, but as a way to make money. So of course, the more money he makes, the better. This doesn’t surprise me, people certainly have a right to make money, but I do find the extraordinary focus on profit in American corporations to be extremely annoying. It’s almost always not “make a buck”, but “make two bucks and screw everyone in the process”. The pharmaceutical companies are the perfect example, charging Americans three times the price for some prescriptions as compared to Canada or Germany, simply because they can. Makes me want to launch into some sort of parental “back in my day” tirade, but then, it’s always been like this as far as I know. It’s just gotten increasingly more annoying to me, and it SEEMS more prevalent in general as corporations continue to gain clout. Arrrrgh. I’m sure that pretty soon George W. will be wearing a Coca-Cola pin in his lapel in order to get sponsorship dollars for his campaign. Well, enough venting for now I suppose. It was a damned fine game, and the Giants won.